Most of those who contemplate to set up a small electric car conversion manufacturing line for carrying out semi-skilled conversion jobs will never make any headway beyond conceptual stage, even though it is not at all a difficult job to do. The major reason for this is the prohibitively high costs involved in such jobs. For example, in order to convert a superior model car fitted with entirely new components will cost a huge amount of money, around $5000 to $10,000 that too exclusive of labor costs. Nevertheless, there are a number of methods to cut down on these costs. 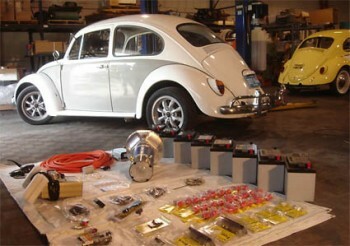 Here are several steps involved in establishing a small electric car conversion business. 1. To start with, one should float a LLC (LTD) company and draw up a detailed plan with specific time schedule. Once a feasibility report is ready, he should apply for a business loan from the bank. If the project is viable, subject to bank confirming the credit worthiness of the borrower, it is not difficult to obtain a bank loan. In several countries, one can apply for a bank loans online on the internet. If the documentation is complete and satisfies the bank’s requirements, one can easily get the loan and start the operations within a week. 2. The next step in setting up the car conversion line of business is to purchase all the electric car parts in bulk quantities. One can save a lot of money when purchasing electric car motors, controllers and various accessories in large quantities by arranging with the supplier bulk discounts as well as price discounts. Apart from this, there will be considerable saving in transport costs. All these factors will result in substantial reduction in the overall cost per car. 3. Final step is to modernize and organize the process to minimize time and labor costs. It is important to use the same type of vehicle for each conversion so that only one set of battery racks needs to be designed and is set up in a specific manner. Suppose one tries to convert five different cars, it requires five different sets of battery racks and along with that there will be variety of problems to deal with, ultimately spending a lot of time and money. Although it is possible to take up more than one type of car at a time for conversion, it involves a lot of time and money on account of additional labor costs. The best way to cut down time by at least 50% is to rationalize and repeat each step from making gear box adapters to installing five sets of controllers. This way conversion of each car can be completed at the same time for delivery to the market. This facilitates selling all the converted cars in one lot, thereby saving costs on advertisement and sales promotion. There is currently a lot of demand for electric cars and it is likely to increase every time the gasoline prices go up. In this scenario, there is no need for spending money on advertising for electric cars. The major car manufacturers making electric cars charge very high prices for electric cars and this automatically creates more business for converted electric cars. The success of this venture depends upon how fast gasoline-powered cars are converted to electric cars. It is very important to convert the cars at the shortest time possible in order to increase productivity and maximize profits. The cars such as the Nissan Leaf will be selling for above $40,000 when it is marketed next year. If the batteries are bought outright instead of leasing, one could convert at least two cars for $40,000 with the same range of 100 miles as the 2011 Nissan For those who have taken up this business for the first time may find electric car conversion job a daunting task. Nevertheless, with a good planning, dedication and hard work, one can reap lots of profits in electric car conversion business.